New York - The latest setback in Europe’s financial crisis is sending stocks sharply lower. The S&P 500, the benchmark for most U.S. stock funds, slumped to its lowest level of the year. Markets fell worldwide after Greece said it will miss deficit reduction targets it agreed to as part of its bailout deal. Concerns Greece is closer to defaulting on its debt overshadowed a stronger reading on U.S. manufacturing. 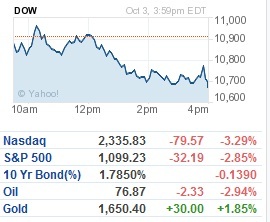 The Dow Jones industrial average fell 258 points, or 2.4 percent, to 10,655. The S&P 500 lost 32, or 2.8 percent, to 1,099. The Nasdaq composite plunged 80, or 3.3 percent, to 2,336. Also, The stock of American Airlines’ parent company plunged to lows not seen since 2003 on new fears that the carrier was headed for bankruptcy protection. The stock dropped on a combination of news and speculation by Wall Street analysts that the only way American can return to profitability is to use the bankruptcy court to cut its costs. The news included a gloomy outlook for the global airline industry and an announcement last Friday that 129 American pilots retired. Shares of AMR, the parent company, tumbled 30 percent to trade around $2 Monday afternoon. The stock price is down more than 75 percent from the start of the year. Shares have not closed below $2 since 2003. Stocks for the entire U.S. airline industry have fallen 40 percent for the year. Obama better do something fast, or I'm going to lose my retirement money and won't have anything to leave my children. But they charge for bags?